Notes on Mexican chocolates and sugars: I’ve tried out this recipe with a couple brands. I have used 2 disks of Ibarra, which is very sweet, so added only about 4 ounces of brown sugar. When I had used a less sweet brand, Moctezuma (which produces smaller disks, needing about 4 of them), I increased the brown sugar by about 1/2 an ounce. Moctezuma has several products of varying sugar levels; I especially like the bittersweet (amargo) and semisweet (semi-amargo) ones. Dark brown sugar such as molasses or Muscovado works nicely, but I’ve also played with substituting half of it with coconut sugar. Coconut sugar has a mildly salted caramel flavor that complements Mexican chocolate. 1/4 teaspoon hot red chile powder, such as an Indian or Mexican variety; cayenne is also fine—adjust to taste! Preheat oven to 350ºF degrees. Grease and line an 8-inch square baking pan with parchment paper or foil as a sling to ease removal after baking. Sift the flour and baking powder into a bowl; set aside. In a large sauce pan, melt the butter and both chocolates over low heat. Stir in the rum, and remove from the heat. Using a whisk, stir in the salt, cinnamon, chile powder, and brown sugar. Try to break apart any large lumps of sugar. Check the temperature of the chocolate mixture to make sure it isn’t higher than 115º to 120ºF, so the eggs won’t curdle. Add the eggs, one at a time, thoroughly whisking them. Stir in the flour mixture until the batter is smooth. Pour into the baking pan, then sprinkle pine nuts over the top. Place in the oven, lower the temperature to 325ºF. Bake 22 to 25 minutes; because I prefer a more cake-like texture, I bake for a longer period—when a toothpick comes out clean. Cool for 10 to 15 minutes before removing from the pan; the center of the brownie will sink a little as it cools. Cool thoroughly on a rack before slicing and serving. This was written by sairuh. Posted on Saturday, July 5, 2014, at 10:48 am. Filed under Food. 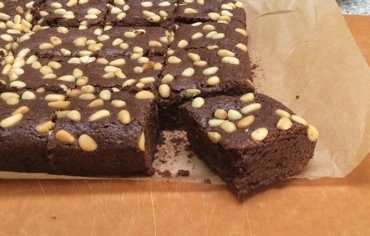 Tagged cake, chocolate, Mexican, pine nuts, recipe. Bookmark the permalink. Follow comments here with the RSS feed. Post a comment or leave a trackback.